Lately we’ve been hearing a lot of complaints from sellers who are frustrated because they listed their home with a discount broker and it didn’t sell. Others have tried selling For Sale By Owner and listing on real estate portals and that didn’t work either. There’s a very good reason for this. The MLS never sold a home, and it never will. People sell homes. Sellers want to minimize how much they pay to sell their home. The logic is the less you pay to sell, the more money you should end up with in your pocket. This assumes discount brokers and For Sale By Owner sites can get you Top Dollar. They can’t! And they’re not motivated to either. To a discount broker your listing becomes an asset that attracts buyers. When the home sells, the asset goes away and thus their ability to attract buyers. Keep in mind; they’re not spending a lot searching for buyers for your particular home. They’re advertising their low price in hopes of attracting future assets. These companies have agents who gather buyers from their low commission listings and often times sell them other company’s listings at much higher commissions. This is called the co-broke fee. When they sell another company’s listing at a higher fee, they also get to keep their asset in hopes it will generate even more buyers. When it does, they can repeat the process. They don’t always attract the best buyers either because they’re not advertising the home to the total market. They’re using MLS as a tool to get it out there on various portals but that’s it. For Sale By Owner sites list homes from owners as they want to attract eyeballs to their site. They can use this eyeball count to attract advertising. They really don’t care if your home sells or not. They just want the eyeballs. It’s a lot like click bait for news stories. New news organizations are popping up and either writing fake stories or outrageous headlines just to get the user to click on it. The more clicks they receive the more they can charge advertisers. When you’re selling your home, there is one thing that matters more than any other. How can I get the most money for my home with the least hassle? Choosing the least expensive option doesn’t guarantee the most money. In fact, it almost guarantees you won’t receive the most money! When we list a home we go out and find the buyer. We don’t sit back and wait. We spend a lot of money advertising, both in print and online. We invest in data analytics, and then serve up ads online to buyers with the income and interests for your home. When we list a waterfront home we can target buyers interested in boating and fishing. We identify the best characteristics for your home, and then serve up ads online directly to buyers that match the criteria and income level. This past weekend we had 2 open houses. Not only did we run ads in paper, we also advertised online. 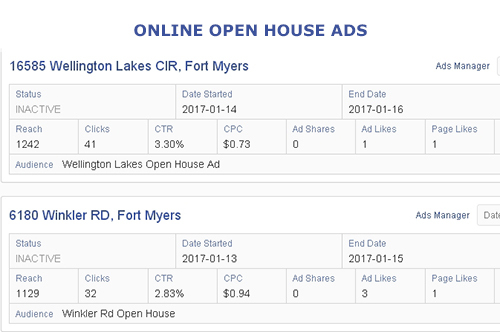 The online ads reached almost 2,400 targeted buyers likely to move and generated 73 clicks to these two homes web pages. It’s no wonder we had a nice turnout because of our proactive marketing. We generate thousands of impressions each month. The past 30 days we had over 6,100 user sessions at www.LeeCountyOnline.com alone. Add in our Blog and our other websites and we’re reaching thousands. We reached 442 buyers from Canada and 365 from the United Kingdom. This is very different than companies that sit back and wait for MLS exposure to sell your home. There’s a reason we get Top Dollar for our homes and they sell 19.7% faster. It’s because we proactively expose your home. We don’t sit back and wait. All agents are not the same. Call the Ellis Team and see how we’re different! The jingle in your pocket will thank you. 239-489-4042 Ask for Sande or Brett! Posted in Cape Coral Real Estate, Fort Myers, Fort Myers Beach, Fort Myers Real Estate, Open House, Southwest Florida Real Estate.